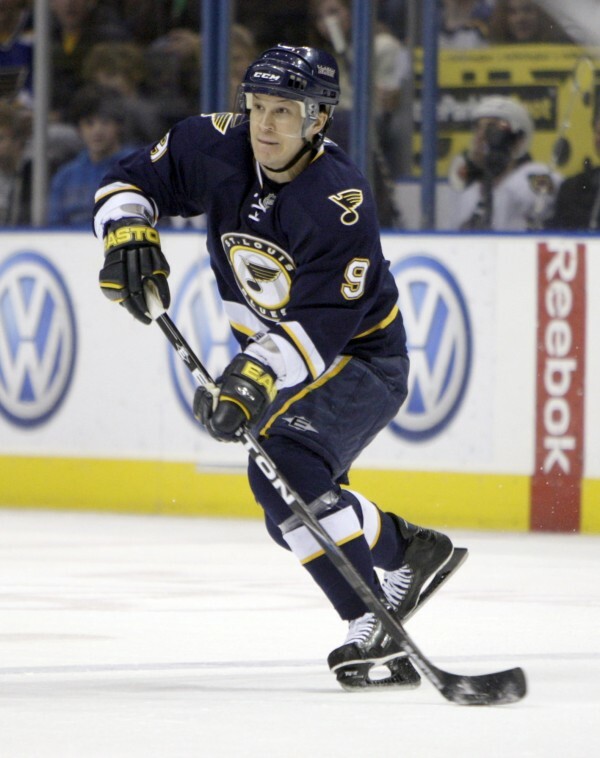 In this photo taken Feb, 6, 2010, St. Louis Blues' Paul Kariya is seen during the second period of an NHL hockey game against the Chicago Blackhawks in St. Louis. Kariya announced his retirement from the NHL on Wednesday, June 29, 2011, after being unable to return from post-concussion symptoms that forced him to miss all of last season. St. Louis Blues' Paul Kariya (right) is congratulated by teammate David Backes after scoring during the second period of an NHL hockey game against the Detroit Red Wing in St. Louis on Feb. 9, 2010. Kariya announced his retirement from the NHL on Wednesdayafter being unable to return from post-concussion symptoms that forced him to miss all of last season. Paul Kariya, flanked by then-University of Maine President Peter Hoff, waves to hockey fans after his No. 9 jersey was retired by the school during a ceremony at the alumni game in July 2001 at Alfond Arena. 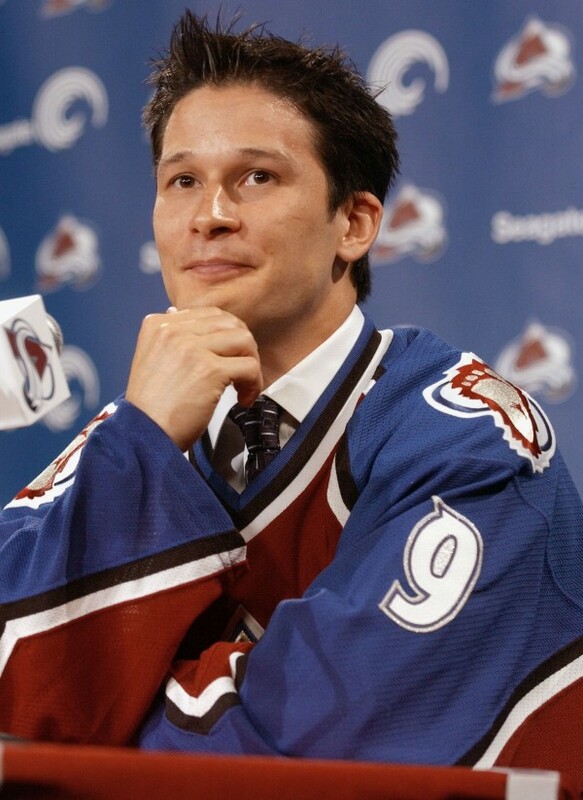 Paul Kariya in July 2003. It happened 18 years ago. Jim Montgomery’s University of Maine linemate, Paul Kariya, was carrying the puck against New Hampshire in Durham, N.H.
Kariya was a creative genius and a tireless worker who never stopped trying to improve himself. His electrifying speed, remarkable vision and great hands made him a fan favorite. The crime is that his NHL career is over after repeated concussions. He sat out last season with post-concussion syndrome and retired last week. Kariya won the Hobey Baker Award that year (1992-93) with 25 goals and 75 assists in 39 games. And Maine won its first NCAA title, going 42-1-2. He is only freshman to win the Hobey to date. He concluded his 989-game NHL career with 989 points (402 goals, 587 assists). He scored at least 81 points six times and had two seasons with more than 100. He had 39 points in 46 playoff games. Montgomery said Kariya was told by concussion specialists that they couldn’t predict what would happen if he suffered another jolt to the head. He thinks he should still be in the Hall of Fame. Montgomery said the 1992-93 season may have represented “the greatest season ever by an individual” in the history of college hockey. It is certainly the best by a freshman. “He made everyone on the team better and propelled us to national prominence by leading us to a national championship,” said Montgomery. He said Kariya was “an elite thinker who always put the puck in the right spot so the (pass recipient) had a lot of time to do something with it. And he knew where everyone was on the ice. “I think if you asked (NHL star) Teemu Selanne, he would tell you Paul is the most creative player he has ever played with,” said Montgomery. Bob Corkum, Kariya’s former Anaheim teammate, said Kariya was a “pioneer” when it came to the virtues of working out hard year-round and eating properly. “He made his mark in the NHL. He was a great player,” said Corkum. He will be sorely missed and the dangerous blind-side hits that contributed to his retirement must be eliminated.